Open floor plan. View of the Living Room. 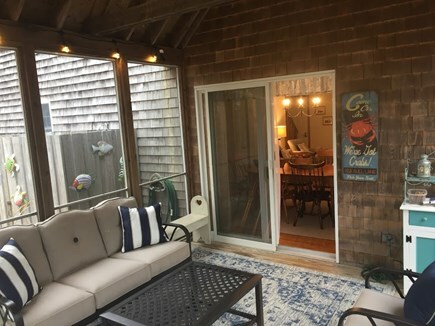 Neat, spacious, and family friendly three bedroom/two bath, Cape-style home located on the bay side of Eastham (less than one mile from Cooks Brook Beach). This comfortable home has an open layout on the first floor with new stainless appliances in the kitchen and central air. The first floor bedroom has a king sized bed and hallway bathroom with shower. There are two large bedrooms on the second floor, 1 with two queen sized beds and 1 with two sets of bunk beds (twin/twin and twin/full). All bedrooms have A/C units and new flat screen TVs. A full bathroom with tub can also be found on the second floor. 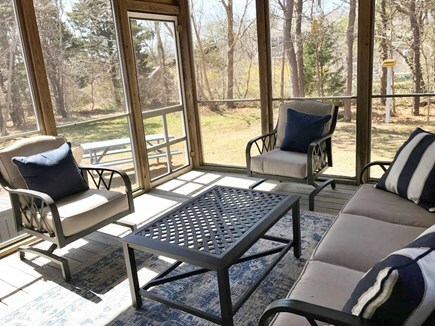 Relax and enjoy gentle Cape Cod breezes in the screened in porch with comfortable seating. Other amenities include a new patio, dining table set, outdoor shower and pool/ping pong table and dart board in the basement. 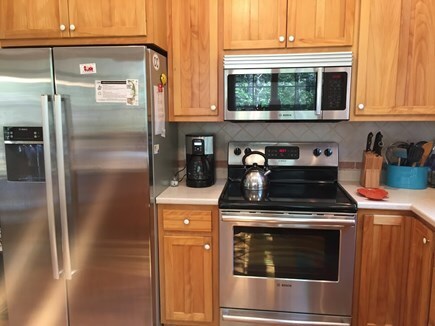 Centrally located in Eastham in a quiet neighborhood, close to bay beaches (<1 mi), Ben and Jerry's, the bike trail (1 mi), and the Cape Cod National Seashore (2.5 miles). A very nice home that had everything needed for a wonderful stay. It's clean, well kept and fully stocked with all the essentials. Thanks Ted & Alicia. Our family has been coming to the cape for many years. 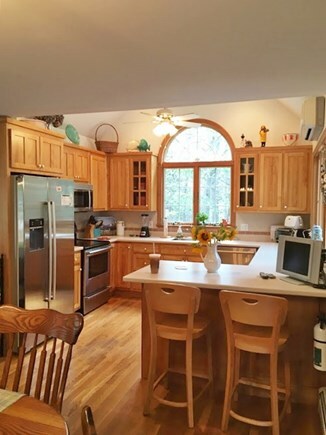 This house had everything that we were looking for in a vacation rental. It is in a very quiet neighbor, close to many restaurants, national seashore and bay beaches. The rooms are very spacious and the house was very clean and comfortable. We intend to return to this home for another memorable vacation. We just returned from a wonderful week in Alicia and Ted's beautiful home. The house included everything we could possibly want. It is very clean, comfortable and organized and in a great location. It is very clear that Alicia and Ted want their guests to have a great vacation and we did! After over 10 years of vacationing on the Outer Cape, we purchased our dream home in 2016. This is our third year of offering it to vacationers. We hope you'll enjoy staying here as much as we do. Our home caters to families. Quiet street where children can safely ride bikes and play outside. Close to ice cream, mini golf, bike trail, drive in movie theater and bay beaches. Pool, ping pong, dartboard, board games and bunk beds for the kids. Adults appreciate the cleanliness, open floor plan, air conditioning, modern kitchen and appliances, spacious bedrooms, new furniture, screened in porch, outdoor shower, new patio and outdoor dining. Bedrooms and bed combinations offer many sleeping options for families of all ages. Connect your phone or MP3 player to the Bluetooth portable audio system. Stream your favorite movies, TV shows and music on any of the 4 smart tvs. Keyless door entry means you won't have to worry about losing or returning keys. 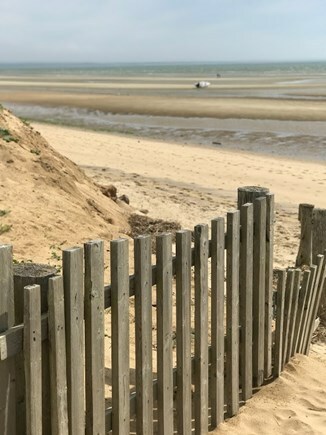 Referred to as the Gateway to the Cape Cod National Seashore, Eastham is part of the Outer Cape, away from the commercial and suburban, yet a short drive to Hyannis Port, the Martha’s Vineyard and Nantucket ferry service, whale watches and hundreds of other Cape Cod attractions. 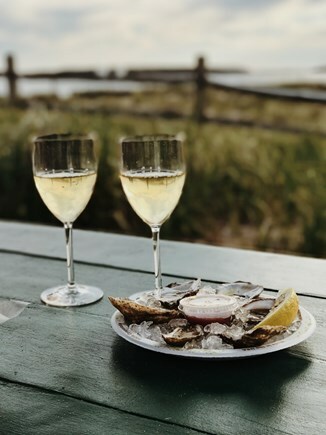 There are long sandy ocean and 7 bay beaches, 2 freshwater ponds, miles of hiking and biking trails, shopping, many dining options for all tastes.